Day 1 Orientation: The first day on the ground is an orientation session during which students will learn about the customs of the country, hear from local police officers and learn tips to avoid drawing attention to themselves. This applies to all programs. My Take: On Day 1 we require all students to attend mandatory orientation to explain the ways to stay safe during the program. Understanding the rules and procedures we have in place is the first step to staying safe abroad. Buddy System (or Rule of 3): No student will venture out alone. In Greece, students will travel in a minimum group of two. In Cape Town, students will travel in a minimum group of three. This rule is non-negotiable and applies to the entire time we are abroad. This applies to five week LEAD experiences. My Take: LEAD programs are full of incredible students from schools across the nation. What better way to get to know them and make new friends than exploring in groups?! We know that the buddy system is important for safety, but it also helps students connect and creates community abroad. Sign-in/Sign-Out: Any time a student leaves the accommodations on a non-Global LEAD group activity, they must complete a sign-out sheet, listing where they are going, who they are going with, mode of transportation and a phone number. This applies to five week LEAD experiences. My Take: This one is easy! Let us know where you’re going. Keep the staff in the loop! Global LEAD Staff Contacts and Availability: All students receive key chains to keep on their person at all times with Global LEAD Program Director and Assistant Program Director phone numbers and all emergency contacts in that country. Global LEAD staff members are available and responsive 24 hours a day. This applies to all experiences. My Take: I love my job because I love the opportunity to support students abroad. Our programs are unique because of staff engagement. I’m there to support students whether they are dealing with a broken phone or missing family and friends at home! Accommodation Selection: We choose hotels that are in safe locations with 24-hour security. We extensively research all accommodation to ensure that our housing is safe and reputable. This applies to all experiences. My Take: The accommodations on all of our program are incredible. We choose these accommodations because they are safe and students also benefit because they are located in great neighborhoods with additional staff support. Dedicated Taxi Service: We have worked with African Adventures and Tours for the past 6 years. All students are instructed to contact a central dispatcher who will then send out a Global LEAD approved cab driver to the students’ location. This applies to LEAD Cape Town and Cape Town Direct. My Take: Ish (the owner of African Adventures and Tours) is the greatest part of the Cape Town programs. 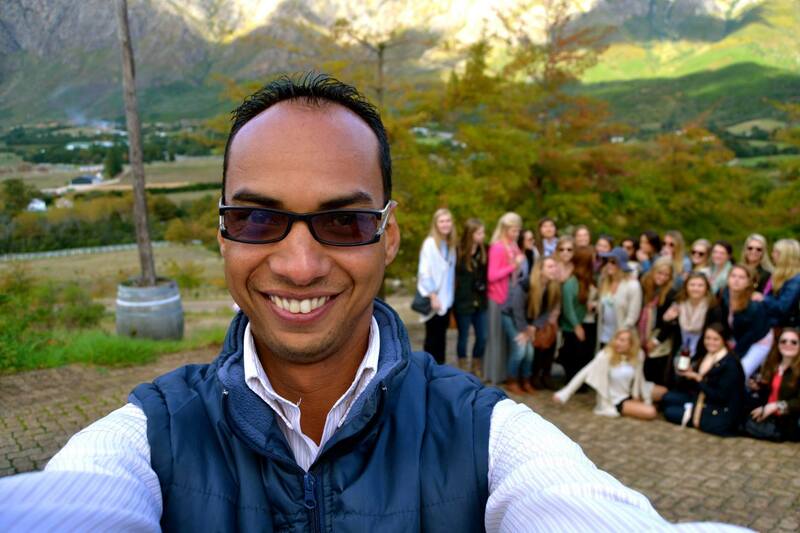 He’s not only one of our favorite South African locals but he works 24/7 to make sure students are safe and enjoying their time in Cape Town. Cell Phone Organization: We partner with Vodacom to offer cell phone rentals. They will receive a reasonable Go Phone and a pay as you go plan. All cell phones come preprogrammed with the phone numbers of all other participants on the experience. This applies to LEAD Cape Town and Cape Town Direct. My Take: Renting a local cell phone is the easiest way to stay connected with program staff and students. Students can call safe taxi rides, stay in touch with family at home and make plans with each other using the local cell phones. OUR VERY OWN, VERY AWESOME DRIVER … ISH! 1. Be extremely alert at any ATM. In Cape Town, Joanna taught us to always go to an ATM in groups of threes. She warned us of the importance of always covering your hand over the keypad when entering your pin number and to have two friends, not just one, stand right next to you with their backs to you, facing outward, to stay alert at everyone that is around. She also warned us about potential scam ATMs, and told us to make sure we were using ATMs that we knew were safe (based on what the hotel staff or the Go Global staff was advising us). 2. Be persistent at any restaurant. The credit card machine must be brought out to your table. Do not let any waiter take your credit card out of your sight — that is illegal! Insist that the credit card machine be brought to the table and placed down on the table for you to see. Make sure to keep an eye on the waiter at all times to ensure that he or she does not pull out a “cell phone,” or any device for that matter, while your credit card is in their hands. That could scan the bar on your credit card without you even knowing, and all your money could be gone. Be alert and be persistent. 3. Keep track of everything in your room. If you have cash that is in the safe, make sure you know the exact amount at all times. Keep all electronics in the safe. Electronics that are too big, like a computer, should be locked with a computer lock in your rooms at all times that it is left unattended. This can be purchased at Best Buy. Check up on every valuable that you leave in the room as often as possible. 4. Do NOT flash your wealth to the world. Leave your nice jewelry at home, and use your big camera in areas that are safe. Always have your camera attached to the neck strap and hold onto it with your hand. Use a cross-body purse with a zipper, and hold it tight to your body. Keep track of all of your belongings by holding them tightly, and do NOT look flashy. 5. Taxis. What made me feel most comfortable about my entire trip was our driver, Ish. He and his staff were the only taxis that we were allowed to take during the trip. Not only did they take us anywhere we needed to go and pick us up whenever we needed to be picked up, they came into every single bar, club, township, or marketplace with us to ensure that we were safe. Ish would never, ever let anything happen to his kids! Never jump in a random taxi. The only other taxi we ever took was the hotel taxi, and we paid attention while he was driving to make sure that he was going the quickest route and charging us the correct amount. Stay alert. We cannot stress enough how much we emphasize safety on our trips. It is so important to always be aware of your surroundings! Hopefully this article has you feeling more prepared for your Go Global trip, and we look forward to teaching you so much more about safety precautions when you come abroad with us.